Last year for IYPF 2013, young delegates from 30 different countries joined Yuvsatta, an NGO empowering youth for peace, in a week full of activities, programs and inspiration. Teaming up with international leaders, local colleges, universities, schools, and volunteers, the program organizers and speakers led stirring workshops on topics of environmental sustainability, international conflict, rights of girls, and building relationships. 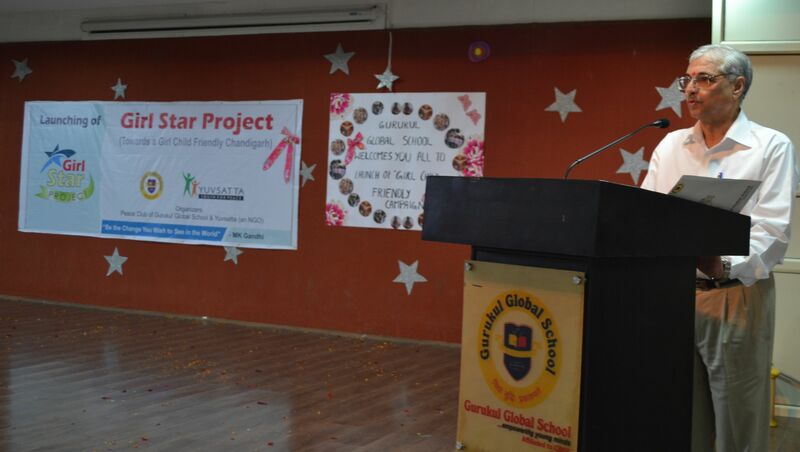 Chandigarh, May 23, 2013: Today, to promote girl child at all levels and make Chandigarh a model in this regard, Yuvsatta an NGO launched a ‘Girl Star Project’ with association of Peace Club of Gurukul Global School, Chandigarh. Mr. Justice Permod Kohli, ex-Chief Justice of Sikkim High Court was the chief guest on the occasion and prominent others who joined included Saroj Mittal, Dy. Director, Education Department, Ninette Vas Sharma, w/o. Advisor, Chandigarh Administration, KK Sharma, Aruna Bhardwaj, Principal, Gurukul Global School & Prof. Anil Sarwal-an educationist. In her welcome address Aruna Bhardwaj said that in the past also they had been conducting activities on raising awareness on rights of girl child, but today, they’re declaring this academic year as ‘Year of Girl Child’ in their School, where in an amalgamation of creative activities & programmes to promote girl child friendly environment will be organized throughout the year. Ninette Vas Sharma expressed that in our society girls have to suffer violence of all kinds from wombs to tombs and it is high time we as true Indians take on the responsibility to raise moral standards for common people and stringent punishments for culprits in our society. Launching the initiative by presenting autobiographies of a great votary of truth, nonviolence and gender equality-Mahatma Gandhi, to the school students, Justice Permod Kohli, said that our country is home to almost 19% of the world children and one third of our countries population, around 440 million, are below the age of 18 yrs, majority of which are in our School system. And the future strength of the nation lies in a healthy, protected, educated and well developed child population who can grow up to be productive citizens of the country. But on the contrary demographic picture today is not very encouraging. And girls continue to suffer the same discrimination and bias, which prevents them from growing up into capable & informed citizens. Saroj Mittal added that schools can lead from the front in inculcating the good values of respect and regard for women among young minds, there is no doubt that we can see the change in present tide of increasing crime & violence against women. Giving an overview of the initiative Pramod Sharma, Coordinator, Yuvsatta shared that there initiative is twofold, one, in which they’ll be approaching local Schools to have more and more girl child centric audio-visual shows this year along with messages on display boards to protect the rights of girl child, other awareness activities will also be promoted like street plays, talk shows, quiz competitions, posters, exhibitions, speeches, interaction among students, parents, even community leaders/women right advocates will also be invited. Secondly they had also prepared a data base of around 1000 marginalized adolescent girls living in slum settlements of the city and in this year they’ll be taking care of grooming and helping them socially, physically and economically. Programme ended with a PLEDGE for promoting girls at all level and purchase of autobiography of Mahatma Gandhi from Yuvsatta by all Gurukul Global School students. 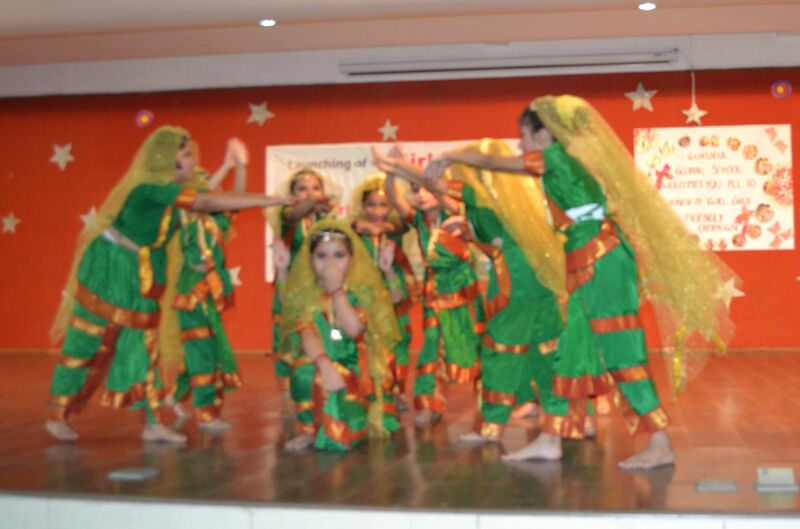 Students of the school also presented a skit showcasing the plight of girls in our society.